We all know that the bottom line in what really counts in building strong communities is ... the people. Committed citizens can pull together and make just about any place better. 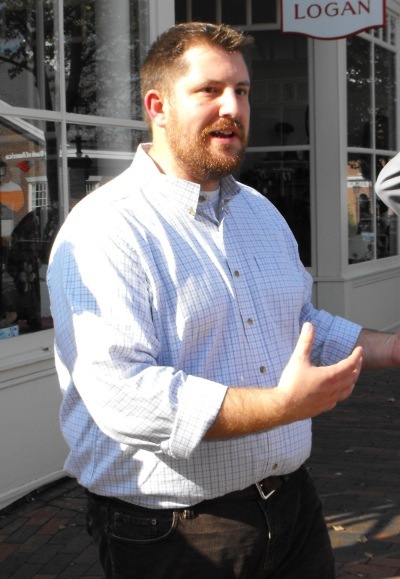 It helps -- as civic consultant Otis White has pointed out -- when there are local leaders (including planning commissioners) who can make a difference. It's hard to pin down, but there's a certain "feel in the air" when you're in a community where people care about each other and about their hometown. Maybe it's that the little things look fresher and better-maintained. Maybe it's that there are people on the street, talking, strolling, and enjoying themselves. Maybe it's that when -- as a visitor -- you stop someone to ask a question, you can soon find yourself engaged in a conversation. Maybe it's pride in the city or town's history. Maybe it's that locally owned stores predominate over national chains. This is not to say these communities don't have problems, deficiencies, and disputes. (In Bath it's issues like future replacement of the U.S. 1 viaduct that slices through the town east to west and, of course, the health of Bath Iron Works). But it's the sense that this community can deal with them. As I mentioned the other day, Bath's retired planning director Jim Upham used three words to describe the city: "Bath is real." 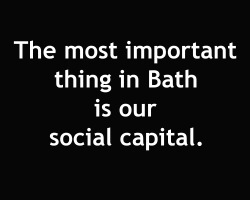 Andrew Deci, the city's new planning director was talking about something similar when he told us, "the most important thing in Bath is our social capital." I returned to Bath on Saturday morning, the day after the Northern New England planning conference ended. I wanted to take some photos and walk around a bit more, since I didn't have enough time during our planners tour the day before. Downtown Bath was a beehive of activity. 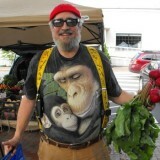 First thing I spotted, as I headed down to the waterfront: the outdoor farmers' market. 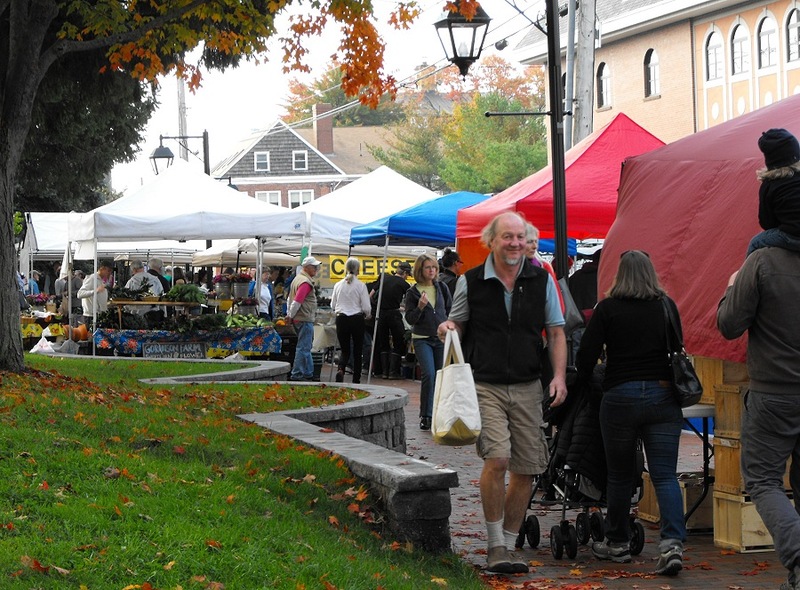 We've run articles in the Planning Commissioners Journal on how farmers' markets -- besides providing fresh produce at reasonable cost and helping local farmers -- can help bring a community together for something enjoyable. That sure seemed to be the case in Bath. But there was a lot more going on, as dozens of people were setting up rows of tables and displays inside the waterfront park. 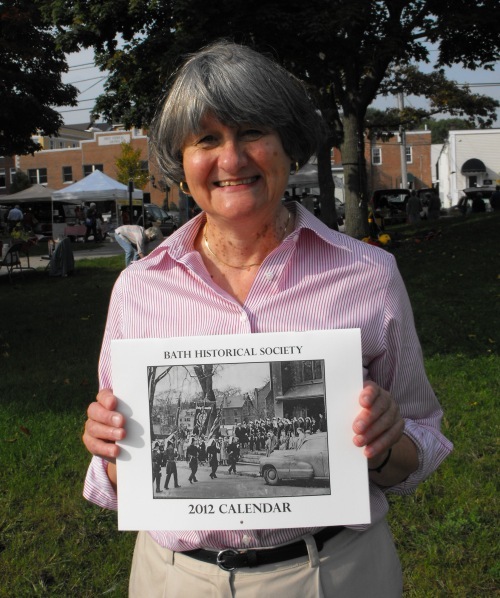 I had happened on two other Bath "traditions" -- Autumnfest and Citizen Involvement Day. 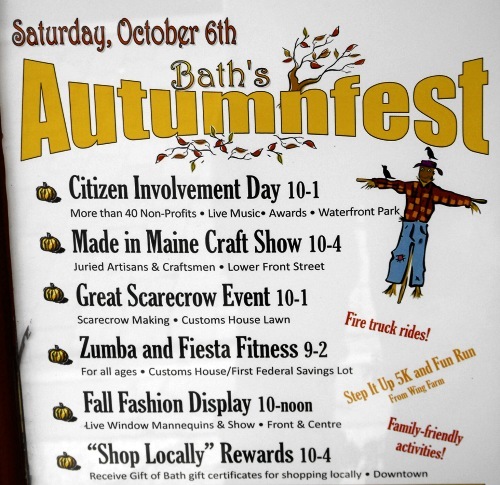 It's a day when kids charge in front of their families to get downtown; and a day when just about every community organization in Bath can tell residents what they're doing -- and how to get involved. And, given the political season, a day when candidates vying for office were well-represented. I spoke with Gretta Wark, working at the Obama campaign booth. She moved to Bath eleven years ago from San Francisco, and told me she loves the community feel of Bath. Down the path I met Craig Phillips and learned about Tedford Housing -- which provides housing for the homeless in the area (I mentioned Tedford in my post on the Brunswick Landing project). Next to the Tedford table, I got filled in on the Friends of Seguin Island Light's efforts to preserve the nearby lighthouse off the mouth of the Kennebec (it was commissioned by George Washington in 1795, and is Maine's tallest and second oldest lighthouse). After chatting for a couple of minutes, I knew that next time I visited Bath I'd be taking a side trip there. Next table, several folks from the Bath Historical Society had set up displays. 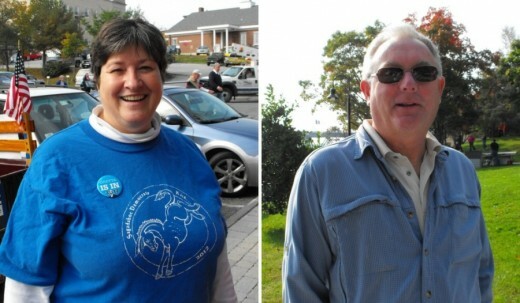 I spoke with Jane Morse (a familiar name from my last post), the group's president. Morse told me about some of Society's current projects -- and sold me their calendar! 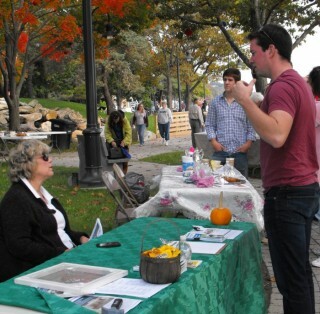 This was, she believed, the 14th year for Citizen Involvement Day. And so it went. By the time my hour of talking and walking had ended, the park was starting to fill up. Heading back to Front Street, a barbecue was in the works in front of the old Customs House; a fire engine was taking young people for a ride; and kids and their parents were busily working building scarecrows. I think, when you come right down to it, it's the people who make Bath a "real" place. Elaine Cogan's Getting Out to Where the People Are. How a shopping mall became the location for a creative planning event. 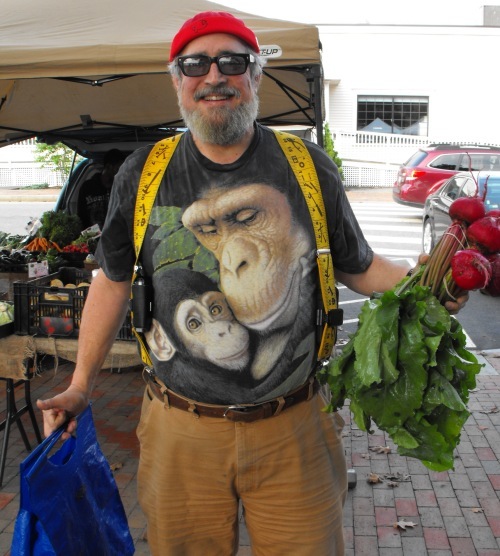 The Farmers Market in Grand Junction, Colorado (plus a conversation with Richard McCarthy, founding President of the National Farmers Market Coalition). To Market, To Market. Roberta Brandes Gratz takes a look at the growing importance of farmers markets to our downtowns. Not Yet a PlannersWeb member? Join Today.